Vive lighting control, leveraging Lutron’s Clear Connect wireless technology. Vive features a full family of simple and scalable solutions, from simple area switching and occupancy sensing, to individual wireless control of each fixture, all tied together with a wireless hub for central control and monitoring. It uses software that works on any smartphone, tablet, or PC to automatically detect the controls closest to the installer. With Lutron’s Clear Connect wireless, XCT sensing, and Hi-Lume dimming technologies, Vive works the first time, every time, without costly callbacks. 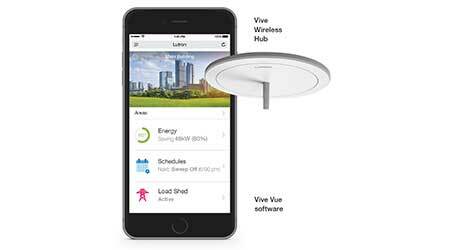 Vive allows facility managers and building owners to monitor, adjust and manage their system from any smart device, and quickly adjust lighting controls to accommodate building churn, improve occupant comfort and enhance energy efficiency. The Vive wireless hub provides centralized functionality including timeclock scheduling, demand response, and energy reporting that helps bring out the best in any building. Vive is also fully scalable – start with a single room and expand as needed. Vive system components include a wireless hub, dimmers, switches, and wireless controllers. Vive can seamlessly integrate via BACnet with other building/energy management, HVAC, IT and audio-video systems. Paired with Lutron Hi-lume Premier LED drivers for flicker-free dimming down to 0.1 percent, Vive delivers an ultra-reliable, high-performance, end-to-end solution.